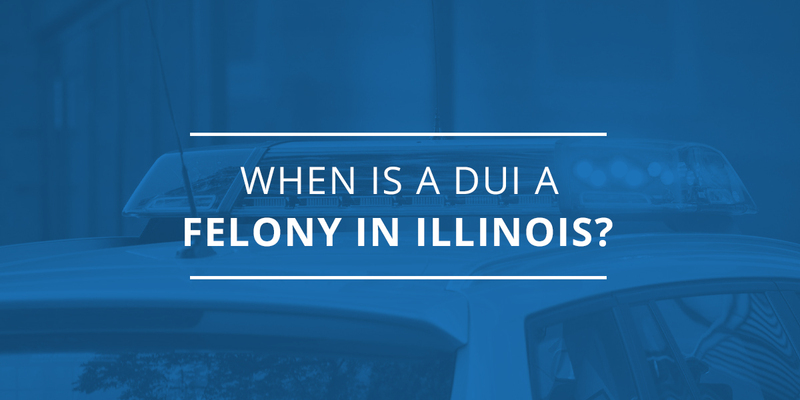 When is a DUI a Felony in Illinois? Depending on the circumstances, a DUI arrest can be charged as either a misdemeanor or a felony in Illinois. Felony DUIs come with steep penalties, including fines and lengthy jail time. Read on to understand the differences between misdemeanor and felony DUIs in Illinois, and what to do if you are charged with DUI. When is a DUI a Misdemeanor in Illinois? If you are caught driving with a blood alcohol level (BAC) of 0.08 or higher, you can be arrested for driving under the influence. In addition to alcohol, driving while under the influence of prescription drugs, illegal drugs, or medical marijuana can also land you with a DUI charge. If this is your first or second DUI, you might only be charged as a misdemeanor, which carries a maximum penalty of a year in jail and a $2,500 fine. Depending on the circumstances of the crime, however, a DUI can also be classified as a felony. Circumstances that trigger a more serious sentence are called aggravating factors. A DUI with aggravating factors is known as an aggravated or felony DUI. Depending on the aggravating factors involved, an aggravated DUI may fall into one of three felony classes, each carrying different penalties. Class 3 felonies in Illinois carry a punishment of two to five years in prison and up to $25,000 in fines. An aggravating factor that can trigger a class 3 felony DUI is having a previous conviction of a reckless homicide if your DUI causes a fatality. The attorneys at Schierer & Ritchie have decades of combined experience handling DUI cases throughout Peoria and the surrounding areas. Our Peoria DUI lawyers will fight to defend your rights. We have a proven track record of getting our clients’ charges reduced or even dropped, and we can even help you challenge the automatic license suspension so you can continue living your life. If you are being charged with a DUI, you can contact us anytime for a free initial DUI consultation. We offer evening and weekend appointments to work around your schedule, and we are happy to meet with you by phone, at our office, or at a location that is convenient to you. We look forward to your call! Who Pays My Medical Bills When I’m Injured in an Automobile Accident? What Happens if I Get a DUI with a Child in the Car?